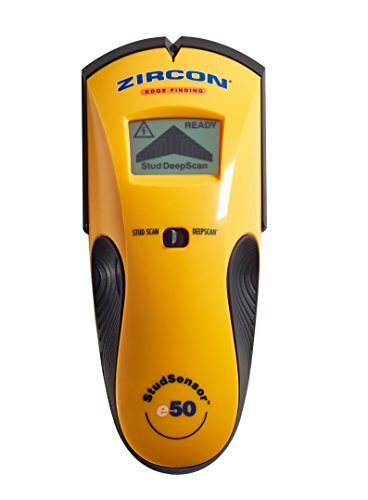 The Zircon StudSensor e50 is an electronic edge finding stud finder. The e50's body design reduces normal scanning errors and can be comfortably held in either hand at any angle while the rubber over molded grip also provides a secure hold. The SS e50 easily locates the edges of wood and metal studs and joists behind walls, floors, and in ceilings with just one pass. In StudScan mode, the SSe50 locates the edges of shallower wood or metal studs up to 3/4 of an inch (19 mm) deep. Switch over to DeepScan mode to double the scanning depth to 1.5 inches (38 mm). This stud sensor is programmed with a WireWarning Detection feature that indicates the presence of live unshielded electrical wires up to 2 inches (50 mm) deep when using both stud scan modes. Finding studs using this edge finding tool is simple. To get started, install one brand new 9V alkaline battery (not included). Place the unit flat against the wall and press the Power Button to calibrate the sensor. Once you hear a beep indicating calibration is complete, continue to hold the Power Button and slowly slide the tool across the surface. The easy-to-read LCD will alert you as the stud detector approaches the edge of the stud in both scanning modes. Once the edge is detected, an arrow-shaped SpotLite Pointer will illuminate and an audio tone will sound. DO NOT DRILL HERE! Instead, mark the spot and continue past the stud. Repeat the process in the opposite direction and mark the opposite edge of the stud. The center of the stud is midway between the two marks. Make sure to note whether the WireWarning Detection is alerting to live, unshielded AC wiring before drilling between the two marks into the center of the stud. With the Zircon StudSensor e50, you can safely maneuver through the most complicated of projects with the professional confidence that comes from owning a Zircon.